The protein complex is mTORC1, which regulates cell growth and metabolism. Immunologists found mTORC1 acts in response to cues from in and around developing T cells and intersects with metabolic activity, to influence whether the cells become conventional or unconventional T cells. The protein complex is mTORC1, which regulates cell growth and metabolism. St. Jude immunologists found mTORC1 acts in response to cues from in and around developing T cells and intersects with metabolic activity, to influence whether the cells become conventional or unconventional T cells. To their surprise, researchers found that disrupting mTORC1 led to metabolic changes that favored development of unconventional T cells at the expense of conventional T cells. The research comes amid excitement about harnessing the immune system to fight cancer, tame autoimmune diseases and combat infectious diseases. "We know that conventional and unconventional T cells are fundamentally different, they express different cell surface receptors. The cells have different functions. But until now the mechanism that helps decide their fates has remained largely unknown." said corresponding author Hongbo Chi, Ph.D., a member of the St. Jude Department of Immunology faculty. T cells play a central role in the adaptive immune system, functioning like elite commando units trained to find and eliminate specific viruses and other threats. T cell development occurs in the thymus after immature (precursor) cells in the bone marrow travel there to mature and specialize. Their specialty is signaled partly by protein receptors on the cell surface known as T cell receptors (TCRs) or antigen receptors. 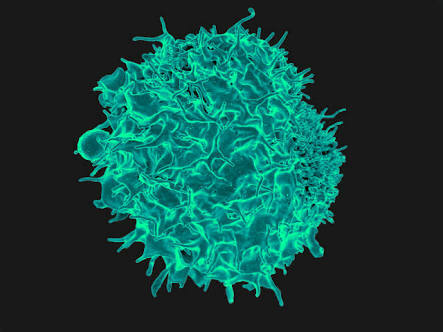 T cells depend on the T cell receptors to recognize targets and respond to changing conditions. In humans, the vast majority of T cell receptors have an alpha (α) protein chain and a beta (β) chain. These are conventional T cells that circulate widely and reside in the spleen and lymph nodes. A smaller number of T cells carry receptors made from a gamma (γ) and a delta (δ) protein chain. They belong to the family of unconventional T cells that are found in the gut, skin and other barrier tissues. When investigators disabled mTORC1, metabolism was disrupted, which was associated with a reduction in the αβ T cells and an increase in γδ T cells. Deleting a key component of mTORC1, a protein called RAPTOR, disabled mTORC1 and altered the metabolic balance in developing T cells. The change reduced anabolic metabolism but increased levels of toxic molecules called reactive oxygen species (ROS) and upregulated activity along a molecular pathway that promotes cell growth.